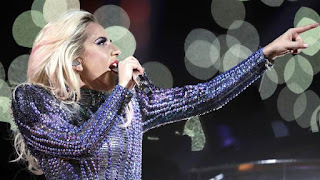 Watching the Super Bowl halftime show, it seemed like Lady Gaga had other-worldly power, controlling a galaxy of lights behind her as she entertained the stadium. Those lights were actually Intel's Shooting Star drones, 300 of which were launched above NRG Stadium in Houston to bring an extra sparkle to Gaga's show. It's the first time the colorful drones were used at an event of this scale. "Lady Gaga and the Super Bowl creative team wanted to pull off something that had never been done before and we were able to combine Intel drone innovation with her artistry to pull off a truly unique experience," Josh Walden, senior vice president and general manager of Intel's New Technology Group, said in a statement. Of course, the biggest sporting event of the year comes with plenty of security precautions. The secret behind the overhead display: The drone show was filmed last week. Intel received a waiver from the Federal Aviation Administration, which regulates drones, allowing them to fly up to 700 feet and in more restrictive airspace. Each quadcopter has LED lights that can create 4 billion color combinations, according to Intel. The entire swarm is able to be controlled by a single operator and computer. One Shooting Star drone weighs less than a volleyball. Keeping safety in mind, Intel said the drones are made of flexible plastics and foam and do not contain any screws. So now that the world is buzzing about Shooting Star drone technology, here's the bad news: You can't get your own fleet just yet. While Intel says the drones meet Federal Communications Commission specifications, they haven't been formally authorized. For now, Walden said it's all about inspiration. "The potential for these light show drones is endless and we hope this experience inspires other creatives, artists and innovators to really think about how they can incorporate drone technology in new ways that have yet to even be thought of," he said.